Super excited to feature this novel on my blog today and I can’t rate this book highly enough! This novel has all the perfect ingredients of a brilliant 5* Genius read and it is no surprise to me, that Waterstones have chosen it as there thriller of the month for May! Britain, a Christian country where theft is not only illegal, it’s also considered a sin. So few modern brits, are aware of the thievery, of their ancestors. I urge you to read this novel. It’s not only a brilliant read but an education on the impact of colonialism. It just may shatter your illusions of the Empire! This novel is historical crime fiction, set in 1919 India following a case with the Imperial Police Force. The protagonist Captain Sam Wyndham is a new arrival to Calcutta and a former Scotland Yard detective. Having known death and misery all his life and fresh from the battle scenes of the Great War he hopes to start a new life with his new posting. Partnered with Sgt ‘Surrender-not’ Banerjee, a native of India and arrogant/bigoted Inspector Digby they are summoned to their first case. A dead body has been found in a ‘gullee’ alley/open sewer adjacent to a brothel. The throat has been cut and the eyes have been pecked from the head. The corpse is that of Alexander MacAuley and he has a note stuffed in his mouth that reads “no more warnings English, blood will run in the street. Quit India”. MacAuley works for the Government in Bengal, who’s central job is to act as a peacekeeper between the British and the natives. Is this a political killing? If so who and why? There are several comparisons between Calcutta and London, this helps you understand the setting much better. There is a genuine feel for the people, weather, buildings, atmosphere and the culture. You really get a sense for the weather with descriptions such as monsoon rains and steaming jungle humidity. There is one very significant paragraph where Sam can hear the Muezzins call to prayer at 5.30am. I lived in Cyprus, right on the border to the Turkish North, despite being an atheist myself, there is an incredible beauty in waking to hear the unity of people in prayer. The novel is a very honest portrayal of the impact of colonialism on the natives. Something we gloss over or whitewash in British history, too often. The novel talks of the divide in race and also how inferiority/superiority has driven a division between two races of people. We see how wealthy businessmen are able to manipulate the Bengalis, purely motivated by greed. Upon arrival at the Bengal Club Sam notices a sign stating “no dogs or Indians beyond this point”. How did 150,000 Brits rule over 300 million natives? When it is assumed this is an assassination of a senior British official by native ‘terrorists’ I am forced to ask myself who are the real terrorists? We slowly become aware that there is corruption and cover-ups leading right up to the peak of those in the colonial hierarchy. In Calcutta anyone can be bought for the right amount of Rupees, Brit or native! But what happens when a man discovers his morals? Is that a death sentence itself? When there’s an attempt to rob a local Darjeeling mail train and a train guard is killed, Sam becomes convinced there is a connection. I love the way that Sam constantly questions himself and his surroundings throughout the plot. Will Sam solve the case? Will ‘Surrender-not’ earn Sam and Digby’s respect? Does British justice, mean justice, only for the British? I absolutely loved this novel. I am a huge fan of historical crime fiction and there is nothing quite like this, I have ever read before. Unique with its era and setting, this is one series to follow! Abir MuKherjee has managed to cleverly put together one of the finest novels I have read this year so far! Out of 83 read so far this year A Rising Man is my 8Th edition to the 5* Genius list! Very highly recommended! – 5* Genius. AM: Hi Abby. Thanks for reviewing A Rising Man, and for having me on your blog. Q) For the readers, can you give a summary of your background and your series? A) My parents emigrated to the UK in the sixties and, though born in London, I grew up in the West of Scotland, which other than the climate, is a fantastic part of the world. However due to work, I’ve been an exile in London for the last seventeen years. The series is set in India during the late British Raj and features Sam Wyndham, an ex-Scotland Yard detective who, having survived the First World War, ends up working for the Imperial Police Force in Calcutta primarily because it’s slightly preferable to suicide. He’s assisted by an Indian sergeant, Surendranath Banerjee, but his British colleagues can’t pronounce his name and so re-christen him ‘Surrender-not’. I’m hoping that the series will chart the ups and downs of British India from 1919 to Indian independence in 1947 as seen through the eyes of these two men, but at the same time I expect there’ll be a lot of dead bodies along the way. Q) One thing I absolutely loved about your novel, was the historical elements. What was the inspiration behind the era and setting? Why Calcutta? A) I find the period of British rule in India a particularly fascinating place and time, unique in many respects and one that’s been overlooked, especially in terms of crime fiction. I think that period in history has contributed so much to modern India and Britain, and it was a time that saw the best and the worst of both peoples. Q) The two main protagonists Cpt Sam Wyndham and Sgt ‘surrender-not’ Banerjee, are very different. What was the thought process behind their characterisation? A) That’s a great question. I think we have a tendency to view the period of the British Raj either through rose tinted spectacles, or to sweep that aspect of our history under the carpet. Similarly, Indians tend to view it primarily through the prism of Gandhi’s independence movement. I wanted to look at the period from a different angle and I felt the best way to do that was through the eyes of two individuals, one British and one Indian, but both unwedded to any preconceived notions. Sam comes to India as a jaded cynic, unwilling to swallow any preconceived notions his superiors might have about the natives, and Surrender-not, though Indian, is British educated. Both men are, to a degree, fish out of water. Q) The novel is very detailed in regards of its honest portrayal of colonialism and the British Empire. What was your research process? A) My family is from Calcutta, so there was a lot of asking of questions of old family members and friends. I also made a few trips to the city and that helped to get a sense of the place. During one visit, I was lucky enough to be given access to the Calcutta Police Museum where a lot of the police documents from the period are on exhibit. That was fascinating, as the Kolkata Police today has a rather ambivalent view of its own history during that time. In terms of research though, most of that was done sitting at home and trawling the internet. Q) I have read many novels on colonialism, rather ashamedly more regarding Africa than India. I found this novel to be very educational, in terms of that you really feel you’re within the era. Was that your intention? A) To a large extent, yes. The Raj period isn’t really taught in British schools. In fact, I learned more about German history in the nineteen twenties and thirties than I did about British history in the period. My impetus to write this book came from a desire to tell the story of a time and place which I felt neither British nor Indian sources did justice to. At the same time, I didn’t want to write a history book, but rather a thriller that would tell its own story, set against the backdrop of that historical period. Q) My teenage daughter is obsessed by Indian culture, the clothes, food and sights to see etc. She has made it quite clear, she intends to travel to visit India as soon as she is old enough. Are there any parts of Indian culture that you love, but couldn’t fit into the novel? A) Loads, though not all of it good! I find Indian mythology quite fascinating. The pantheon of stories of gods and demons and heroic figures which has been built up over thousands of years is especially interesting. I’d love to explore some of that side of India in future books. Q) A Necessary Evil #2 in the series is due out 1st June this year, can you give us any snippets of information about the plot? A) The new book is set in 1920 and Sam and Surrender-not find themselves investigating the assassination of the son of a maharajah. Their enquiries lead them to the fabulously wealthy state of Sambalpore and before they know it, they’re in the middle of a case which has sinister repercussions for the whole kingdom. In their time, the Indian maharajahs were the wealthiest men in the world and were revered almost as gods by many of their subjects. A lot of them were descended from warrior kings, but during the Raj they had little real power. As a result, a lot of them became feckless and debauched, spending their money on palaces, harems full of concubines and fleets of Rolls Royces. It just seemed a really colourful period in history and I was keen to see what Sam and Surrender-not would make of it. Q) What was your journey from the original idea to publication? A) My journey was a wee bit different from most debut authors’ tales of dedication and persistence, and I suppose it started as a bit of a mid-life crisis. I’m an accountant by profession and have spent the past twenty years in finance. I was thirty-nine, hurtling towards forty and I thought, maybe there might be more to life than accounting. Then I saw an interview with Lee Child on BBC Breakfast where he talked about how, at the age of forty, he started writing, and I thought, why not? I’d always wanted to write a book but had never had the confidence, and as far as mid-life crises went, writing a novel seemed safer than buying a motorbike and piercing my ear. 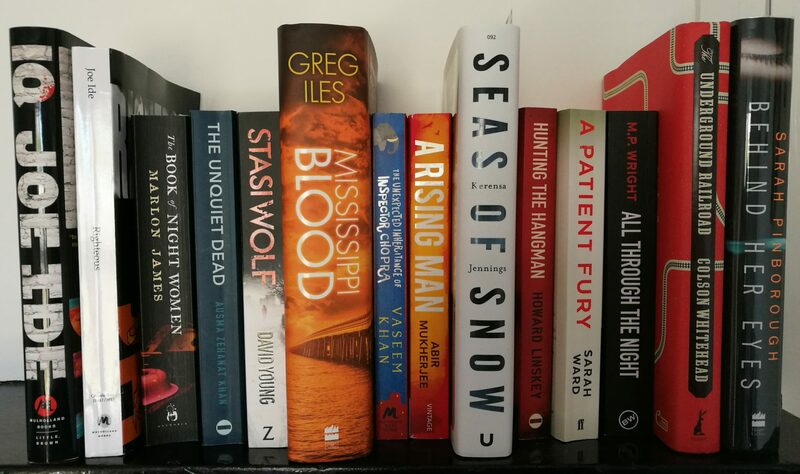 I started writing A Rising Man in September 2013 and a few weeks later, I came across details of the Harvill Secker Crime Writing Competition in the Telegraph, looking for new and unpublished crime writers. I tidied up the first few chapters, wrote the synopsis and sent off my entry. A few months later, I got an e mail telling me I’d won and that Harvill Secker were going to publish my novel. Except I didn’t have a novel, only about thirty thousand rough words which didn’t always fit together. Fortunately, I had a wonderful editor and team at Harvill who, over the space of eighteen months, guided me and helped me to turn those words into a proper novel. Q) Your novel has received huge recognition and praise, what has been your favourite moment of being a published author? A) There have been so many great moments – holding the first copy of the book in my hands; seeing it in the shops; reading reviews in the papers; and meeting some of my heroes such as Val McDermid and Ian Rankin. To be honest though, the best moments have been the personal ones, such as seeing my late father’s name in the dedication and being invited to give a talk at my old school. I hadn’t been back there in over twenty years and it brought back so many memories. I also met up with some of my former teachers who are still there, and that was incredibly special. Q) Will there be a #3 in the series, is this something currently being written? A) There will indeed, and I’m currently writing it (though am way behind schedule). It hasn’t got a title yet, but it’s set in December 1921 and sees Sam and Surrender-not back in Calcutta, on the trail of a serial killer. The backdrop is Gandhi’s civil disobedience campaign of that year, when the Mahatma’s slogan was Freedom within the Year. That year is drawing to a close and tensions in the city are high. Into this charged environment, the British decide to send the Prince of Wales on a visit to India, arriving in Calcutta on Christmas Day. AM: It’s been my pleasure, Abby. Thanks once again for having me on! For those of you who have already read and loved, A Rising Man. You will be delighted to know #2 in the series is due out, just next month!